Want to grow your own food but don't know where to start? 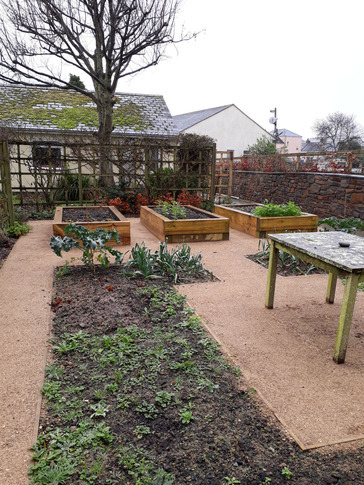 Alison Böckh Garden Design based in North Devon can show you how to grow the tasty fruit and vegetables you want, mentoring you through the growing seasons in your own garden. Do you want to grow fruit and vegetables free from pesticides? Or something different you can't find in the shops? From preparing your plot, propagation to planting out, maintenance to harvest – it’s easy once you know what to do when! Little and often is the key to keeping a flourishing vegetable garden – just as well for busy people with a hectic lifestyle. And few things are easier or more satisfying than harvesting fresh, home grown fruit and vegetables from your own garden . Growing vegetables is a great way to introduce children to gardening, teaching them about their natural environment, healthy eating habits and garden wildlife - not to mention patience! 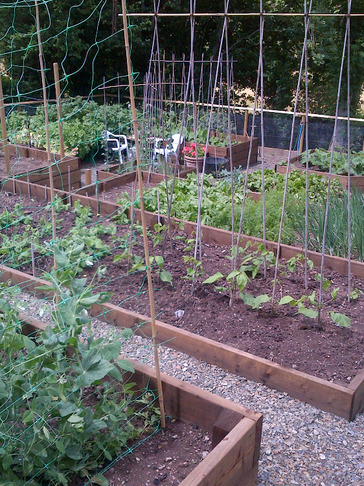 Starting a vegetable plot may be daunting if you’re new to vegetable growing and the information available about growing veg may seem overwhelming at times. 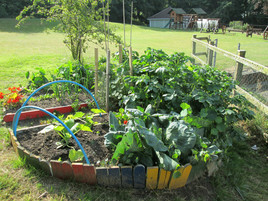 So there are a few things to consider if you are serious about investing in and running a successful ‘kitchen garden'. Firstly, what do you want to eat? Don’t waste time, space and energy growing things you don’t like – this may seem obvious but things that are cheap and plentiful in the shops that other family members do like can be easily obtained. Quick growing crops such as green beans and peas are easy and fun to grow and delicious when fresh but are seasonal so worth the effort. Consider a few permanent crops such as Asparagus - this takes a while to establish but are expensive to buy and worth the wait. And nothing beats home grown strawberries and raspberries, also pricey in the shops. Next consider your space – be realistic about how much room you have and note where the sunny / shady spots are. Is it exposed or sheltered? Most important is your soil – is it heavy, sticky clay or a gritty, crumbly loam? These factors will effect what you can grow well – but most difficulties can be resolved or at least improved. 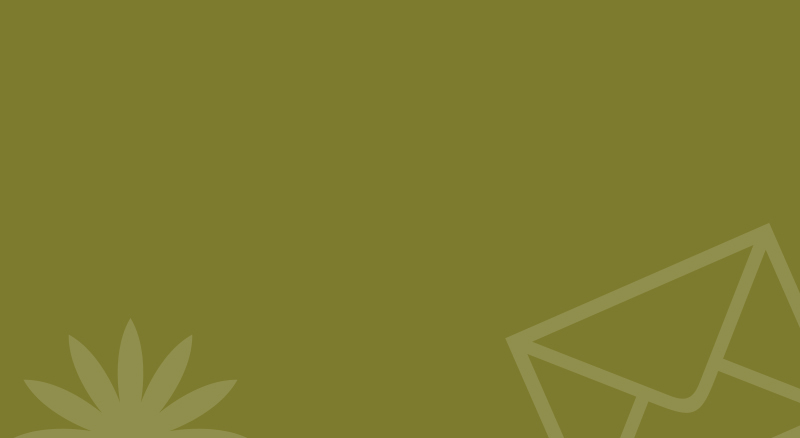 Other issues to consider are practicalities such as a greenhouse for propagating seedlings, a shed for storage, a compost heap - or three, and a utility area for storing bulky items like grass clippings, leaf mould and bags of compost. Now consider where to site all these things ; the sunny areas are good for fruiting veg – soft fruit, courgettes, outdoor tomatoes – and onions. 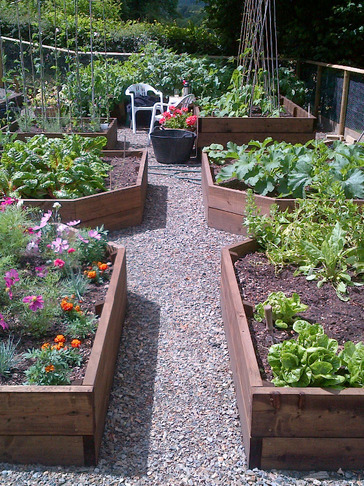 Shadier sites will suit leafy crops like lettuces, cabbages and root crops. And the beds themselves - are these to be raised beds or open ground? A combination of the two is often useful for different crops. Paths around the beds can take up a fair bit of space – but this is not wasteful. A path needs to accommodate a wheelbarrow and the use of larger garden tools so plenty of space around beds makes working the garden more manageable. Suitable surfaces for paths include bound gravel - a fine compacted substrate that drains and copes with wheel barrows well. Recycled crushed concrete is also a cheaper option. Less attractive features such as sheds and compost heaps could be screened off – and the screen can be used to support Tayberries or other climbing crops. You may also want consider a simple pergola or archway to grow climbing veg like beans or to train fruit trees or cordons. And don’t forget a sitting area to contemplate your labours with a nearby bed for herbs and cut flowers. The bees will thank you for it and repay you by pollinating your fruit and veg! Still daunted? Call me to arrange a free initial chat about your vegetable garden project – I love getting people outside to grow their own! And, once you're set up with a veg plot, I can show you how to sow and grow your own produce, making the best of the resources you have. For a healthy fun way to make the most of your garden, or if you would like to arrange vegetable growing lessons, please contact me by clicking here and completing the enquiry form on my Contact Page or email alison@gardendesignernorthdevon.co.uk or call 01805 804322 or 07772147518. Garden Designer North Devon, Landscaper North Devon, Horticultural Consultant North Devon, North Devon Garden Designer.